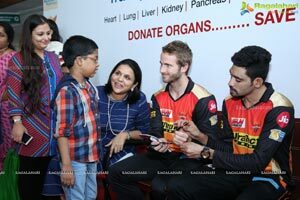 Hyderabad, May 4th, 2017: Sunrisers Hyderabad joined Apollo Hospitals and Jeevandan, to sensitise the population on the need to donate organs and provide a fresh lease of life to several terminally ill patients. 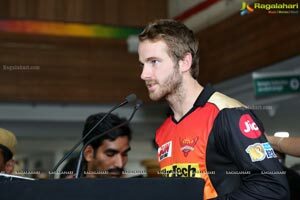 Sunrisers Hyderabad team Members Muttiah Muralitharan, Ben Cutting, Kane Williamson, Siraj Md., and others, along with Ms Sangita Reddy, Jt. Managing Director, Apollo Hospitals; Dr Swarnalatha, CEO, Jeevandhan; Dr AGK Gokhale, Sr. Consultant Cardio Thoracic Surgeon; Dr Subramanyam, Sr. 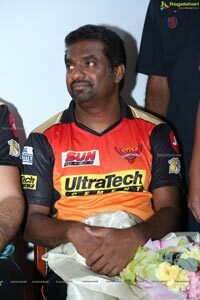 Consultant Urologist; DR SVSS Prasad, Sr. 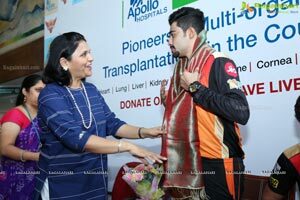 Consultant Medical Oncologist; Dr Manish Verma, Consultant Liver Transplant Surgeon, Apollo Hospitals; organ recipients, volunteers, doctors, general public, took a pledge to donate organs and encourage others to come forward and pledge their organs, on Thursday at Apollo Hospitals, Jubilee Hills. In India the burden of end organ disease is steadily on the rise. Transplantation of liver, kidney, heart, lungs, pancreas and intestines has become the standard of care for the treatment of the respective organ failures, with a stupendous success rates of 90-95% across all organ types. However, despite the good outcomes, transplantation is done in less than 5% of all patients who need it and the biggest hurdle being availability of suitable organs for transplantation. Currently, majority of transplantation in our country are being done using live donor organs (from people who are alive), as a healthy live donor can donate a kidneys and a part of his liver, though it carries the risk of complications for the donor, post donation. However, transplantation of heart, lung and pancreas is possible only through donation of cadaveric organs. 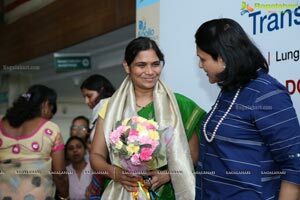 Speaking on the occasion Ms Sangita Reddy said, Organ donation is a GIFT of LIFE, not only for the patient who receives it but also for his/her near and dear. Today there is a huge discrepancy between the number of organs available for transplantation and the people who need them, over 1.6 lakh patients are waiting for Organ transplantation, because we don't have adequate organs available through organ donation. 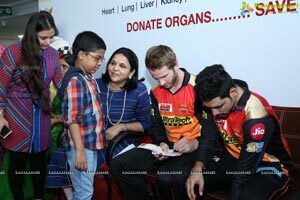 Therefore the need of the hour is to educate the populace about organ donation and the tremendous difference it can make to the life of patients with organ failure. Transplant recipients, who are incapacitated, are totally dependent and are a financial burden to their families, go back to their normal life and become the breadwinners for their families. 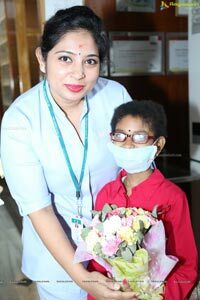 Children who undergo transplant return to school and lead a normal life, thereafter. 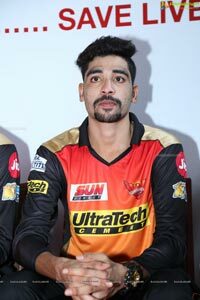 Today, Sunrisers Hyderabad team members came forward to sensitise the public on the need to donate organs and help patients in dire need of organs. 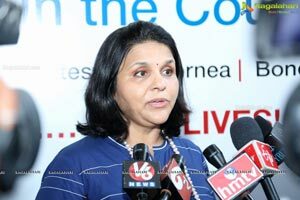 She said, Apollo Hospitals runs the world's largest multi-organ transplant program with results on par with the best in the world. 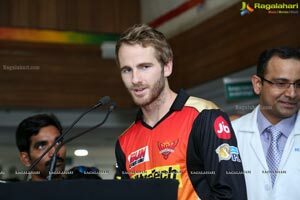 Sunrisers team member Kane Williamson said, we are extremely humbled to give a hand to such a fantastic cause of organ donation, its moving to hear that five hundred thousand people suffer each year by not being able to receive organs. 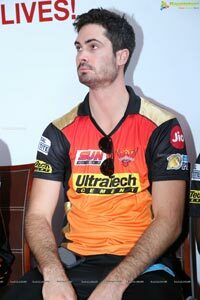 We are fortunate to help create some awareness by being here. 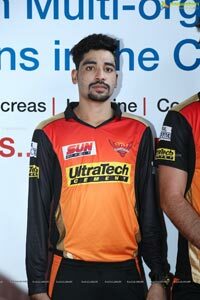 Dr Swarnalatha said, happy to have Sunrisers team here to create awareness about the very noble cause of organ donation. 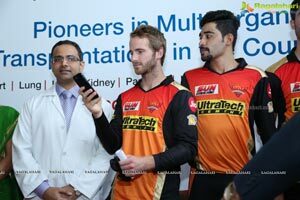 Organ donation is the need of the hour and such a popular cricket team endorsing the organ donation cause will give a boost to the initiative. 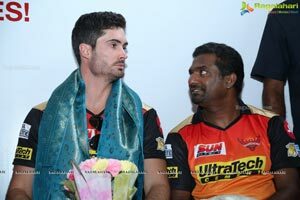 Jeevandhan is a Telangana state government program. Many are suffering from organ failure and are dying daily, simultaneously many are also dying due to brain deaths with functioning organs, these organs are our national resources. 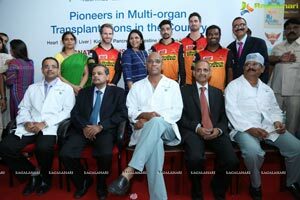 Government has come forward to streamline the organ donation transplantation through Jeevandan. 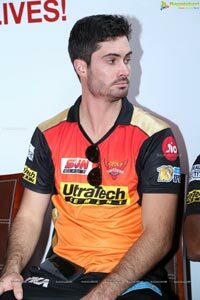 It's a five year old program with 300 plus donations, at a donation rate of 4.5 per million population in comparison to the national average of 0.5 per million population. We are the leaders in organ transplantation and have the potential to become the world leaders. 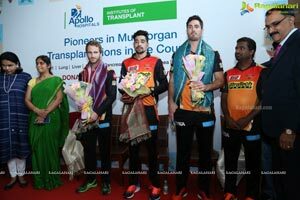 I sincerely appreciate Apollo Group of Hospitals for taking initiative to raise awareness about Organ donation and constantly working towards the cause. Donation after death is the effective solution to address the problem, as it can provide all organs for transplantation in addition to safeguarding concerns about live donor safety. Each brain dead person can save up to seven lives by donating their organs comprising of liver, both the kidneys, pancreas, intestines, heart and lungs, besides aiding patients in need of Corneas, Heart valves, skin, bones, vascularized composite tissues etc., says Dr Manish Verma. 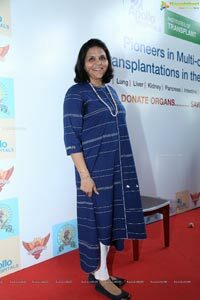 Dr AGK Gokhale said, Heart and lung transplants can only be done by retrieving organ from brain dead people. There are more than 50000 people waiting for heart transplant and 25000 for lung transplant in the country and are dying because of lack of organs as the donation rate in our country is a dismal 0.5 per million. We have a long way to go and many more people to save through organ donation. 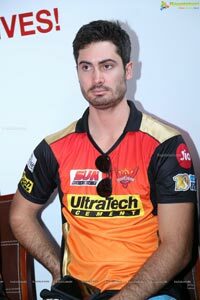 There is no greater act in life than donating organ and this awareness initiative should help many in need. While 36 persons per million of population donated organs in Spain in 2014, 35 donated in Croatia, 27.02 donated in the United States, only 0.34 donated in India. Currently, about 600 organ donations happen every year in our country, which is a significant progress from the rare 1-2 per year about half a decade ago. This has been possible due to the facilitatory role of the government bodies and sustained effort from NGOs and medical community. 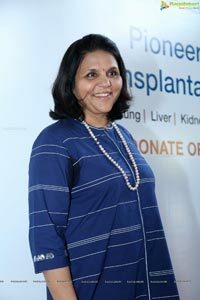 Any concerns about the organs being distributed preferentially or unjustifiably has been addressed and all cadaveric organ donations and organ distributions are done directly by government bodies like NNOS in Tamil Nadu, Jeevandan in Telangana and AP, ZTCC in Maharashtra, ZCCK in Karnataka etc. National and Regional Organ and Tissue Transplant Organization (NOTTO and ROTTO) have been structured to facilitate organ sharing between different states so that donated organs are not wasted and made available to patients who desperately need them. 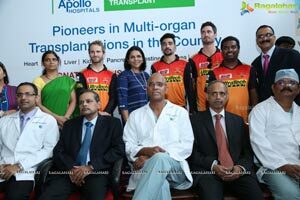 The Apollo Transplant Institutes (ATI) is one of the world's largest and most comprehensive solid transplant programs. ATI offers a host of state of the art services including Peritoneal and Hemo-Dialysis, Management of Liver Disease, Management of Kidney Disease, Liver and Kidney Transplantation, Corneal Transplantation, Heart and Lung Transplants, Intestinal, Pancreas and GI Transplant Surgeries and Pediatric Transplant Services. In 2016, the Apollo Transplant Institutes conducted over 1437 transplants thereby making it the busiest program of its kind outside of the United States. The Institutes are spread across 14 locations offering a mix of services that are equipped to take care of the entire spectrum of liver, kidney and gastrointestinal diseases. With 90% success rates, Apollo Transplant Institutes' program is a beacon of quality and hope for patients from across the world. It was in 1983, that Dr. Prathap Reddy made a pioneering endeavor by launching India’s first corporate hospital - Apollo Hospital in Chennai. Now, as Asia largest and most trusted healthcare group, its presence includes more than 10000 beds across 65 Hospitals, 2000 Pharmacies, 92 Primary Care and Diagnostic Clinics, 100 Telemedicine units across 10 countries. Health Insurance services, Global Projects Consultancy, 15 colleges of Nursing and Hospital Management and a Research Foundation with a focus on global Clinical Trials, epidemiological studies, stem cell & genetic research and the first Proton Therapy Center across Asia, Africa and Australia.